Focusing on environmental responsibility on the theme ‘Earth Sensitive,’ the Responsible Fashion Summit was held recently for the second consecutive year to redefine sustainability and to bring solutions that are relevant to the issues that the global fashion industry is facing today. 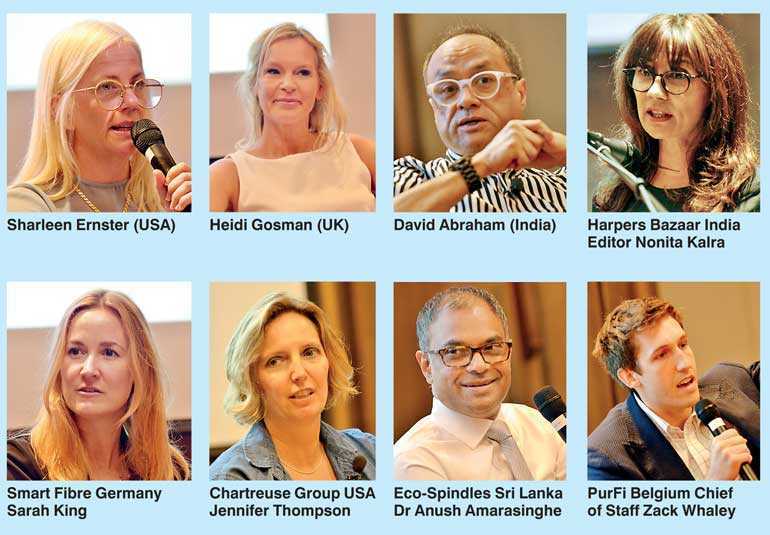 Concentrating on eight impact areas including design, community and craft, fabric, production, logistics, retail, consumption and disposal, the Summit took place at the Hilton Colombo with many representatives from the local and international fashion and apparel industry. The Responsible Fashion Summit is part of the Responsible Fashion Movement that was launched last year. He further stated that the world needs responsible fashion and Sri Lanka has a good story with a position to lead this movement in the region and expand it with an inclusive platform which can have international followers as well. MAS Director and CO-founder Ajay Amalean addressing the audience explained about the ‘Eco Go-beyond’ program which MAS launched with the intention of creating awareness on sustainability among the future generations of the country. 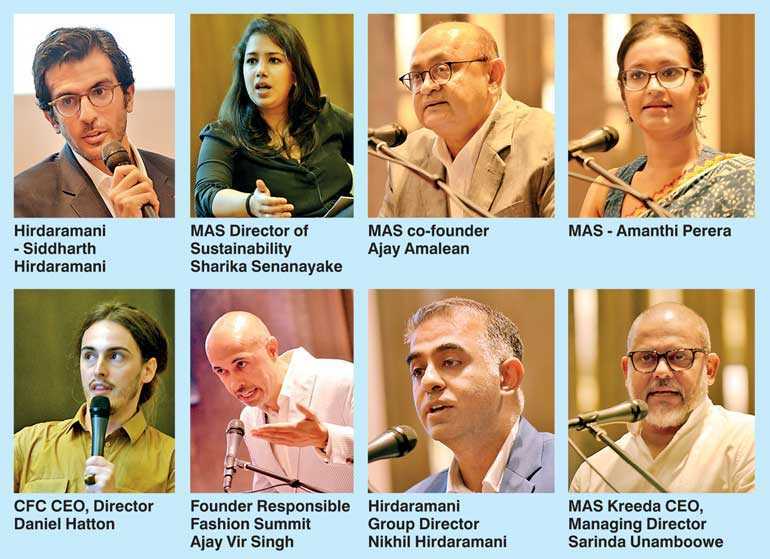 At a forum discussion in the summit, Hirdaramani Director Siddharth Hirdaramani and Sharika Senanayake spoke on how responsibility in fashion can be a part of the business plan. Can disposal be part of the design strategy? Speaking at the event, We-are-HAH Founder Sharleen Ernster (USA) spoke on how she was practicing sustainability in her business. “With the introduction of technology particularly from this region I was able to start a business founded on three pillars, sustainability, consumer service, and transparency. We’re far from perfect, but we try to make every little step responsible. The journey of being in corporate really made me think about making a product with purpose, slowing down and making products that last, and utilising product processes that were sustainable,” she said. David Abraham (India) explained how he uses designs to preserve the traditions of the Indian culture as part of sustainability. “We produce only in India and we have a focus towards small scale industry, particularly craft, because we have ingrained craft and textile traditions in India, with small scale manufacturers. Sustainability in our context is not necessarily sustainability that is understood within international context because sustainability also means maintaining traditional views on life, and also maintaining traditions that are leaving, dying or the last sources of the world,” he explained. “For our designs we try to engage and work with craft people and the product is contemporary and accessible to a very large audience. When it comes to the subject of sustainability and disposability, we need to realise that short lived trend can also be very dangerous,” he added. Heidi Klein Swim Founder Heidi Gosman stated that they always start with the design and then progress on the product development. “As a team we always start with the design. We consider the impact on the environment at each stage of manufacture and then work backwards in coming up with the design. In the UK we do not recycle clothes as much as we should be, and it adds to the landfills, but this is something me and my team are looking at,” she elaborated. “It all begins with the editor’s note. We do not just feature vanity but it’s a manifesto that promises to support responsible fashion. I think it’s important to know what took place in the past to start any conversation about the future and for us the future is one goal. It has to start from within,” she insisted. Kalra also believes that it is important to know where the story started. According to her, when the team at Bazaar runs out of inspiration they turns to the icons, looking at the people who made history, who started the gold moment of revival. She also noted that if the gold moment didn’t exist there would be no story of sustainability or home grown brands. “Responsible consumption means you have to recognise the people and the work that goes into production. Apart from that we also celebrate people who make our clothes. We take our job of educating readers seriously. We want to reconnect them to the process and particularly processes that are under threat or lac popularity. Today the world’s organic sustainable responsibilities are inherent to the dialogue around fashion. They’ve become a serious movement, and it’s no longer possible to ignore that or deny that. The reason for this is simple, it is now a necessity,” she added. During the panel discussion on innovative sustainable fabric that unburdens the earth, Eco Spindles (Sri Lanka) CEO Dr. Anush Amarasinghe, Smart Fibre (Germany) CEO Sarah King, Taylor Home and Fashions (USA) CEO Jennifer Thompson, and Pur Fi (Belgium) Founder Zack Whaley discussed the impact of fabric on sustainability and the way forward. Sarah King spoke on how she practices and promotes sustainability through her latest fibre ‘Seacell’ which is made out of seaweed. “What we came up with was using technology to advocate sustainability. Seaweed for Seacell is harvested from Iceland Fjords in a very sustainable way,” she elaborated. Zack Whaley also spoke on how his company utilises waste as a practice of sustainability. “The purpose of Pur Fi is not to actually be a sustainable company itself, but the fabrication of stretching the boundaries which means essential input brings the excellence of an output. We started on that by continuously stretching that margin. Naturally we ended up utilising waste, the lowest potential costing product,” he said. Commonwealth Fashion Council (CFC) CEO Daniel Hatton spoke on how the CFC brings together industries from different sciences and different schedules, open them to conversations which normally doesn’t take place. He said that there are 20 fashion councils in the Commonwealth Fashion Council which are the institutions that is used for the programs of the CFC. The Council is also a membership programmed organisation. Hatton also discussed the agenda for this year in an effort to depict the accomplishments of the CFC. “We also have the government industry initiative which has been an important and credited organisation. We have fantastic access to governments and hold an account on the programs we do because we all face depressive challenges in the industry and civil societies,” he stated. “We also have the opportunity to create and encourage fashion designers, artists and manufactures to come together to create products that are 100% made within our commonwealth which is also less costly. We have series of fashion conversations happening across the commonwealth and this year we focus on the theme testing now which is commonwealth fashion priorities. These conversations happen across the commonwealth which are inspired by principles and values,” Hatton added. Speaking on the Social and Labour Convergence Project, Hirdaramani Group Director Nikhil Hirdaramani outlined the global initiative. “The Social and Labour Convergence Project is going to be implemented this year and it will transform the industry and solve the dilemma of initiative we’ve had for over 25 years. Ajay Vir Singh started this campaign and was an industry initiative by the Sri Lankan apparel industry in 2016. The dilemma which I’ve been talking about is Order Fatigue. Order Fatigue is a huge issue in the industry and Sri Lanka in 2006 tried to attempt to do it. There are various reasons for as to why we didn’t do it at the particular time. But I think we are in a very different era now with collaborations, eco-policies, etc.,” he stated. He stated that what they were trying to achieve through this project was getting multiple stakeholders together to create a collaborative standard. The project brought multiple stakeholders together through many meetings during the last two-and-a-half years. “We have been working together so we have the light of competitors, different brands together in the same room, working on a tool that we are going to launch later this year to help improve working conditions and solve the dilemma of order fatigue. So we have two prominent approaches with the actual tool reducing the duplications of the order fatigue. There are 177 signatories so far and it’s amazing. If we looked at this 10 years ago who would have thought Nike and Adidas will be working together to create this tool. This is really going to change the industry, it’s going to save a lot of cost and it’s sustainable,” he elaborated.